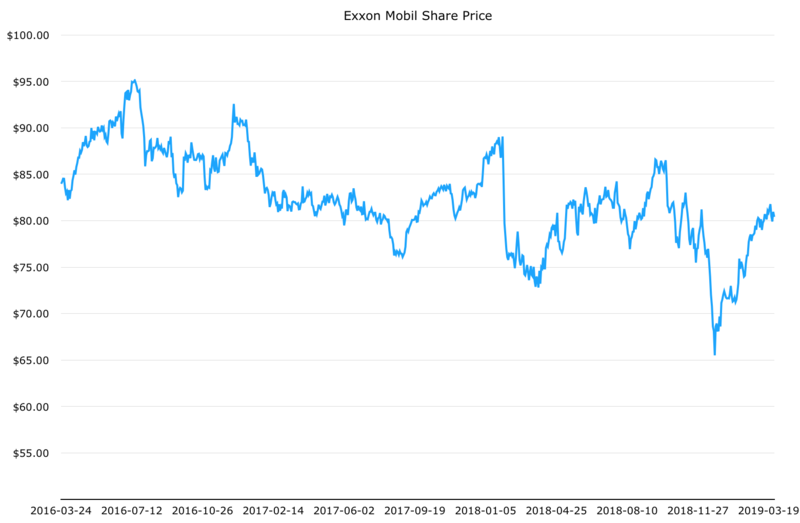 Over the past three years ExxonMobil (NYSE: XOM) stock has noticeably underperformed compared to its four super-major peers: Chevron, Royal Dutch Shell, BP and Total of France. $10,000 invested into Exxon stock three years ago is currently worth just $10,780. In contrast, that same $10,000 lump sum invested into any one of its peers would currently be worth anywhere between $14,300 and $17,800. (N.B. Analysis assumes continual reinvestment of dividend cash). In truth there’s no great mystery behind ExxonMobil stock’s recent poor performance. The fact of the matter is that its shares never really got cheap during the oil price crash of 2015/2016. In fact, the cheapest they were over the past few years was actually just before last Christmas. Compare that to say Royal Dutch Shell stock, which lost almost half of its value between 2014 and 2016. That said, the past is the past, and right now ExxonMobil is a decent long-term proposition. I say that for two reasons. The first is a point I’ve made a number of times when it comes to dealing in very cyclical industries such as oil & gas. As a general rule of thumb, an okay time to buy is when conventional valuation metrics look reasonable in times of “normal” commodity prices. Does that apply right now? Well, as it stands Texas light sweet crude oil is trading for just under $60 a barrel. In terms of the future oil prices that strikes me as pretty middle of the road. After all a barrel of crude has priced everywhere between $15 and $100 over the past few decades. At constant $60 oil Exxon should make around $5.50 per share in annual profit within the next two years. Plugging that figure into the current $80.50 share price leaves us with a forward P/E ratio of under 15. On that basis I’d chalk the stock up as reasonable in terms of valuation. (The outlook from that level certainly surpasses the last three years of poor returns). The second reason relates to the company’s cash flow situation. It has improved, a lot (from an already decent base I should add). For instance, over the past decade Exxon has spent roughly $260 billion in total on capital expenditures. Now, for oil & gas companies this is of paramount importance since if you don’t replace what you pump out of the ground then at some point you cease to exist. In this case, the number I just quoted – $260 billion – actually goes a bit beyond the “steady state” scenario of maintaining operations because Exxon actually replaced around 110% of the volume that it pumped out of the ground. Total cash generated from day-to-day operations clocked in at around $395 billion over the same time frame, while the total spent on cash dividends amounted to almost $110 billion. Finally, the average oil price over the period was just over $70 per barrel. Now take last year in isolation. Exxon generated over $36 billion in cash from its oil, gas and chemical operations. After subtracting capital expenditures and dividends it had $7 billion left over, of which $5 billion went toward debt reduction. The average oil price over 2018 was only around 7%-8% higher than current prices. My takeaway from all of these figures: Exxon should continue to pump out billions of dollars in surplus cash at $60 oil. With a starting earnings yield of around 7% it is not a bad long-term buy at current oil prices.